This past Fall, I decided to try a Pinterest project to use as homemade Christmas gifts. I started the project in October with a goal of being completed by Thanksgiving. 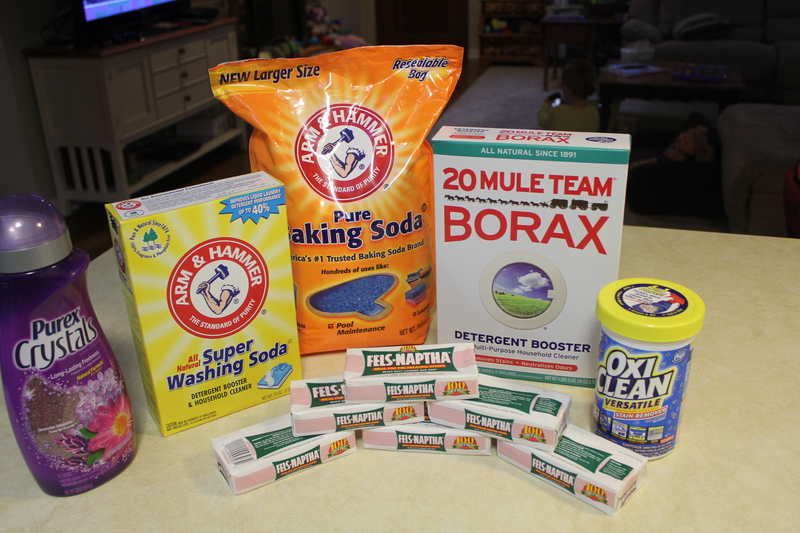 I chose to make homemade laundry soap because I have heard its a great way to make fresh natural laundry soap for a fraction of the costs at the store. I loosely followed a recipe from HowDoesShe.com. I loved this recipe because it listed amounts per the box sizes found in stores! So helpful! I also added a bit of Oxi Clean but not as much as the original called for. I think my rough estimation for cost of these supplies was around $20. The Oxi Clean is the most expensive which is why I only used a small amount. The first and only major step in this process is the grate the blocks of soap. Many suggested doing it manually with a cheese grater but there is no way I could do that while chasing DJ around. So I got out the food processor! A few posts I read mentioned to put a bit of the baking soda by the blade so the soap wouldn’t get mushy. 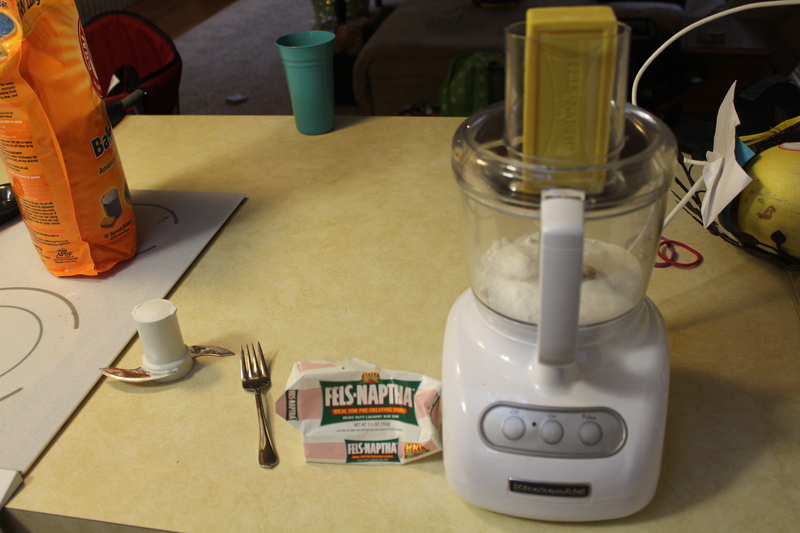 I had the grater blade at the top and turned it on and slowly pushed the bar of soap down. I found that the slower I pushed was actually the better because it made for finer shavings. The next tip I read which was great was to “layer” your ingredients in a large 5 gallon bucket. I have some large mixing bowls and there was no way they would be big enough to hold all this. 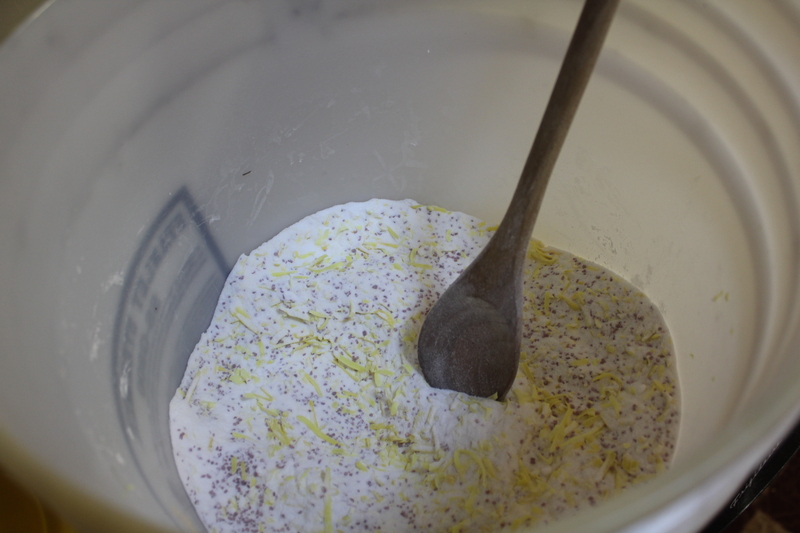 It looked all pretty in the bucket with the purple crystals and the light yellow soap shreds! I used it for a month and made sure it worked well. I found that I had to use about 1/3-1/2 cup per load in my HE front loader machine (more than I typically would have thought to use) but it worked really well! 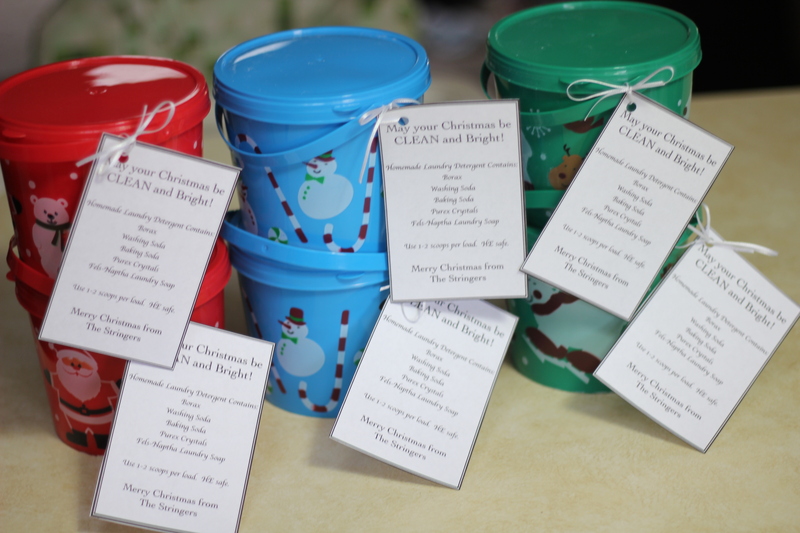 Once I knew it was safe to use, I packaged it up and handed it out for Christmas gifts! I found the little buckets and scoops at the dollar tree. Yesterday I had to stop and get some burgers for dinner. 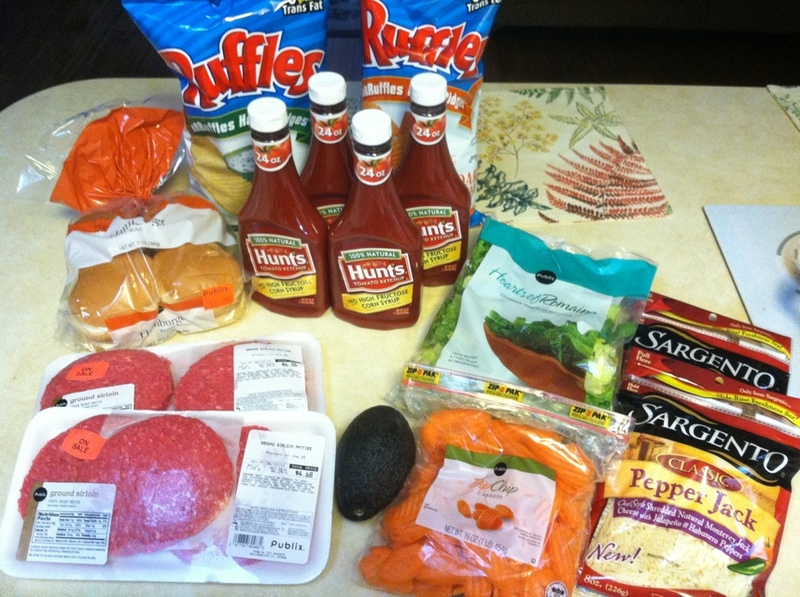 Nobody wanted to cook so I was already frustrated that I was going to spend an arm and a leg for pre made burgers. I was able to print out a few coupons though in about 5 minutes before I went to the store an ended ip hoping for the nest. I was figuring this would all cost about $20. After looking at sales here is a picture of everything I got for $20! I was really happy that for under $20 we had a quick and easy dinner! One of the things J and I are working on right now is saving money by clipping coupons. As a fun post, I thought I would share each Monday what my best finds of the week were at our favorite grocery store, Publix. I actually went shopping last week because the deals were so great I couldn’t resist. I am going back today to pick up a few more things I want since we still have some money left in our grocery fund for September. I think we got some really good sales this week. I was super happy about the cheap Nestle Break and Bake cookies since I always have lots of company and fresh cookies is always a great welcome. For $0.77 each, you can’t beat the price! Plus with the break-and-bakes, you don’t have to do a full batch. If you just need three cookies, that’s all you have to make (although, why I would only need three cookies, I don’t know). Some brand of salad dressing always seems to be on sale. $0.70 per bottle is about as cheap as I’ve seen it. Wishbone is typically a bit cheaper than the Kraft brands anyways and with the great $0.75 off coupon and buy one get one free sale its really a great deal. For these, I usually buy some version of Italian dressing because we use that the most in marinades and it doesn’t matter what brand it is. The item with the least discount is also one of my favorites of the week. Oscar Myer lunch meat. Typically these are almost $4 at Publix but you can easily wait for a sale when they drop to $3. We usually buy the Hillshire Farms brand because its a bit more meat, they are always $3 and you get a re-usable container. However, when I found the $1 off coupon, this brought these to a great price. This is one of the items I am going back today to pick up some more. Overall this week was a great trip. Lots of food that we need and use and at 67% off savings, it really was a great trip.